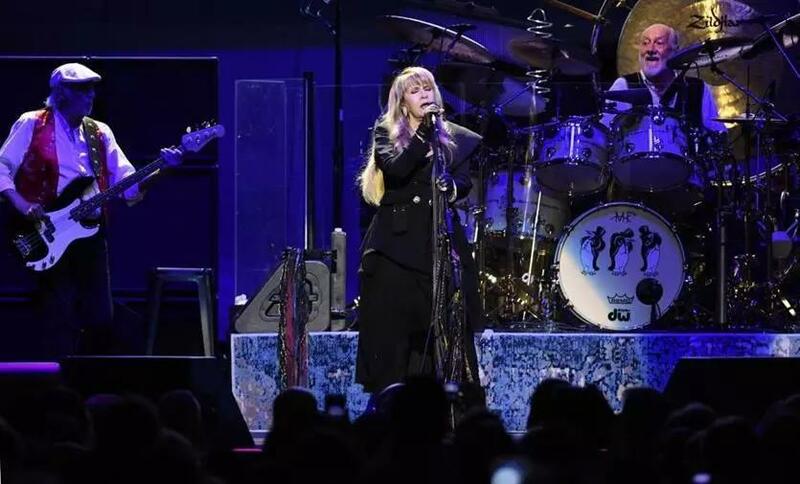 From left: John McVie, Stevie Nicks, and Mick Fleetwood of Fleetwood Mac performed Sunday at TD Garden. The Fleetwood Mac show that is scheduled to take place Tuesday night at Boston’s TD Garden has been canceled and will be rescheduled because of a band member’s illness, according to the venue. It was not immediately clear which band member was affected or what the illness was. The band’s publicist did not immediately provide a comment. Some fans didn’t apparently didn’t get the word in time and showed up at the Garden. Fans responded to the news with a mix of disappointment and understanding. “I guess if you’re sick and not feeling well, it’s best to stay out of the public,” said Dawn Jones, who sported a Stevie Nicks inspired jacket for the concert. Evelyn Bowie, 54, took the train from Maine, and didn’t learn the concert was cancelled until she arrived in Boston. “If we’d known, it would’ve been way better,” she said standing outside the box office. Bowie said she grew up listening to Fleetwood Mac as a teenager and got the tickets in November. She said that while she understands that someone was sick, she wished the concert was canceled earlier since traveling to Boston was expensive. She said she is unsure if she will come back for the rescheduled concert because it’s difficult to take time off from work. Peter Napolitano, 61, who is also an Everett city councilor, said he hopes the musician feels better and will be back on the road soon. “If somebody gets sick, somebody gets sick,” he said. He said he and his wife Vivian would change their plans for the night. “We’ll listen to some Fleetwood Mac in the car,” he said. The rescheduled date has not yet been announced. TD Garden said ticketholders can also get a refund if they cannot make the new date. Due to a band member illness, the Fleetwood Mac show scheduled for tonight, April 2nd, in Boston, Massachusetts will be rescheduled. Ticketholders should retain their ticket for the new date which will be announced shortly. Alternately, refunds are available at point of purchase. The band played their first of two TD Garden shows on Sunday. Lindsey Buckingham left the group last year, leading them to recruit Neil Finn and Mike Campbell to fill Buckingham’s shoes. However, two of rock’s most distinctive voices, Stevie Nicks and Christine McVie, were still on hand for Sunday’s show.